LinkedIn is a powerful online professional networking platform with more than 450 million worldwide registered users. Every second there are more than two new signups and there are well over a million unique visitors every month. You probably already know that LinkedIn is popular among the job-seeking crowd. The truth is, there are more than 40 million students and recent college graduates on LinkedIn. So you may be wondering if LinkedIn is tailored specifically for those in the market for a traditional job, or if you — as small business owner — can use the network to grow your business. The short answer is yes, provided you follow some LinkedIn best practices for small businesses. Don't worry. The list below is quite lengthy, but you do not need to implement every single one of these tips to see an increase in your LinkedIn networking power. Pick just a few of your favorite ideas to start, and add more to the mix over time. LinkedIn offers several ways to highlight yourself and your business, the primary method being your personal public profile. Your profile is not only public to anyone searching LinkedIn, but also those use public search tools like Google, Yahoo! and Bing, giving you an opportunity to add a new search-friendly way to promote yourself. The tips below will help your profile pop up in relevant research results and increase your ability to be found online. Use a profile photo: Choose the best profile picture possible. Ideally, this means a professional headshot, but if that's not possible make sure you use a photo that looks professional. LinkedIn is definitely not the place for your beach pictures! Complete your profile: Take time to complete your profile because it helps your profile show up in search results. To complete your profile, be sure you add your industry, location, current position (with a description), past positions, education, at least three skills, at least 50 connections and, of course, your profile photo. Craft a power summary: Write a summary that is attention-grabbing while sharing your personal branding statement. Focus on what differentiates you and makes you stand out from your peers. Customize your URL: Create a customized public profile URL that enhances your personal or small business brand. Your URL can have 5-30 letters or numbers, so be creative and create a URL that is easy to remember. Make it personal: When you start to invite connections with other people, take a few minutes to customize each of your LinkedIn connection messages. This will make your connections more personal and less like a numbers game. Use endorsements: Control what skill endorsements show on your page by changing the order, deleting unrelated skills, hiding categories and removing endorsements from specific users as appropriate. Look for connection possibilities: Check who is viewing your profile in order to find potential new connections. If your profile is set to public, others will be able to see when you look at their profiles as well. Skip auto-posting: Not everything you post on Twitter or Facebook is appropriate for LinkedIn. Avoid the temptation to feed updates from other social networks directly onto your LinkedIn page. Use recommendations: Ask your customers for recommendations on LinkedIn. These testimonials act as powerful word of mouth referrals that everyone visiting your page can see. Send InMail: Use private messages called InMail to connect with LinkedIn members that are not in your network. These highly targeted and personalized messages come with 100% deliverability and are a great way to get connected to new people. Publish on LinkedIn: If you have an external small business blog, use your LinkedIn page as a publishing platform for your small business blog. You can even publish long-form content right on your LinkedIn page once you have added your blog and have publishing capabilities. A LinkedIn Company Page is a where small business owners can showcase their company, products and services, job opportunities and more, and it's a great way to connect with your audience. According to LinkedIn statistics, members are 50% more likely to purchase from a company they engage with on Linkedin. Once you create a Company Page, any LinkedIn member can follow your Page so they see your Page updates in their activity stream. This is separate from your personal profile and a great way to reach a more business-focused audience. The tips below will help you maximize your Company Page. Use the Home tab: Make the most of your Home tab, which gives you an opportunity to provide an overview of your business. This is the place where you can begin the narrative that will guide visitors through the rest of your page. Add images: Images have the potential to garner more attention than text alone, but you need to make sure you are using the right images. Your banner image on your page is particularly important. Don't miss this opportunity to make an impact. Post updates: Use updates on your Company Page that focus on relationship building. The best updates are authentic, relevant and brief. Try sponsored content: Turn your updates into sponsored content to get more eyes on it. Use images or video to increase engagement, and focus on providing something your audience will appreciate, such as advice, education, tips or interesting facts. Use keywords: Use targeted SEO keywords in your Company page content and in your updates to make sure it comes up in search results. This can be a powerful way to grow your page following. Cross link: Link your Company Page to your business website and blog, and vice versa, to cross-promote and help both of your online presences become easier to find. You can even add a Follow button on your website to make it easy for site visitors to engage with you on LinkedIn. Post jobs: If you have job opportunities within your company, use the Careers tab to reach the millions of job seekers using LinkedIn. Build a showcase: Create a Showcase Page to extend your Company Page. With a larger hero image and a two-column design, you can create a highly engaging page focused on one specific element of your company. You can create up to 10 Showcase Pages for your Company Page. Share it: Promote your Company Page in other places, such as your website, email signature, newsletters and on your business card. Make it common practice to add your Company Page to any place where you promote your other social networks. Advertise: Consider using LinkedIn Ads to promote job opportunities, products, and services, or events you are organizing in your business. Use metrics: Review and use analytics that comes with your Company Page. You can view data on your updates, followers, and visitors to see how your audience is engaging with your page, and make improvements to your strategy over time. There are currently more than 2 million LinkedIn Groups, providing topic-focused places to share content, find answers, post, and view jobs, make business contacts, and establish themselves as industry experts. LinkedIn Groups provide a tremendous opportunity for small business owners to forge new connections, strengthen their brands and promote their products and services. Choose your groups wisely: You are limited to joining 50 groups on LinkedIn, and this can be challenging with so many to choose from. When selecting your groups, search for groups that large and have active memberships. Participate regularly: Seek out opportunities to contribute to discussions, share relevant content and make connections with other members. Adhere to the rules: Follow group rules that are set by each group owner to make sure you are not removed from a group, losing the opportunity to engage with potential customers and colleagues. Don't over-promote: Focus on networking and relationship building, not promoting your business. Keep your promotional tactics on your Company Page, and use groups for what they are meant for — relevant networking discussions. Use visuals: Go beyond text conversations by adding images, infographics, downloads, videos and other engaging content to your group conversations. Add value: Share your expertise in groups by answering questions, contributing to conversations and inviting discussions. The more interaction that happens, the more you will set the foundation for relationships. 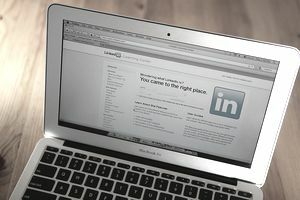 Initiate connections: When you start to have ongoing discussions with people in your Groups, send invitations to connect on LinkedIn to grow your network. Start your own group: Invite colleagues to join you in discussions that are relevant to your target audience. As a group owner, you will have an opportunity to gather a great deal of useful information that will help your business. As I mentioned above you don't need to tackle every one of these ideas immediately to see a change in the way your business can benefit from LinkedIn. Start with a few, then add more as you get more accustomed to using the platform. Once you have mastered these tips, grab the LinkedIn Small Business Marketing Playbook for even more ways to use LinkedIn to promote your small business.